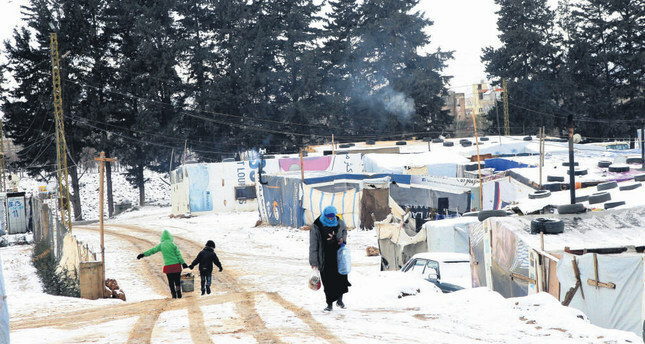 Syrian refugees walking in the snow outside their tents at the Barelias refugee camp in Beqaa Valley, eastern Lebanon. In Turkey the basic characteristic of citizenship is that one is always confronted with a ghost-like bureaucracy with no consistency but still imposes extreme and arbitrary power. It is not hard to predict that this feeling of insolvency is far more intense and terrifying for Syrian refugees. If you are a citizen of Turkey, you can search for an acquaintance at the department where you have to handle a bureaucratic task. Syrians, however, do not have such an opportunity, unless they have money, of course. If one has money, it is not that difficult to come across mediators that can open a channel to the bureaucracy. When it is considered that there are more than 2 million refugees in the country, we can suppose that there is a considerable market in that field. And the helplessness of Syrian refugees is obvious when we consider the ill-functioning laws, rules and regulations; the lack of coordination within the bureaucracy, and the lack of standard implementation norms. As a result, there is a rising tendency toward bribery to resolve problems, and the bureaucracy displays an increasing inclination toward corruption through Syrians.The most important subject in which money is effective is certainly the process of obtaining identity cards, which guarantee refugees' legal rights. This subject remains ambiguous since the state has not yet made its final decision regarding integration. Consequently, while it becomes possible for the relatively prosperous to resolve their problems, this situation can trigger a class-based social divergence within the refugee population. However, the hardships encountered in obtaining identity cards have also bolstered another occupation - the production and marketing of fake identity cards.It is pleasing to see that the government last year had focused on this subject in a systematic way to come up with rational and fair solutions. On the other hand, it is not possible for the bureaucracy to get rid of its current structure all of a sudden since it is based on decades-long practices and deliberate corruption. Rather than being an unintended consequence, the bureaucracy's incoordination is deliberately created. For instance, handling any subject regarding refugees in a different way in every city is not found odd. However, one can come across different "recommendations" even in different departments of the same institution, and even different officials in the same department recommend different things. This is probably caused by every official's habit of handling tasks in their own way rather than unfamiliarity with the rules and legislation, and this type of handling tasks as a result represents a mechanism in place to make money, which does not surprise anyone. We can also add the effect of nationalist emotions, which are still conventional and strongly expressed in the bureaucracy. It is unquestionable that an ideological stance that normalizes discrimination has turned into an ordinary characteristic for Turkey's bureaucracy. In addition, this approach is not only limited to the low-ranking officials who directly address refugees. Today, while the state is assigning a license plate to Syrians, they assign a combination to every of them which starts with the letter S. In other words, is the bureaucracy wants the police to be able to identify Syrians even from afar from their license plates. Many similar implementations, which are claimed to be conducted for security and control and have become an integral part of bureaucratic convention, actually display that discrimination is an approach adopted by the state. The citizens of Turkey may not take any notice of it any longer, or they might create their own ways to escape, but Syrian refugees do not have such an opportunity. As they become familiar with this side of the state, they may not want to remain here permanently. The prevention of waves of migration to Europe requires institutional bureaucratic reforms in Turkey.